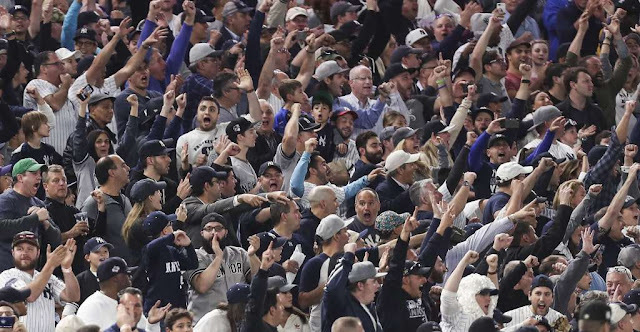 The Yankees rode stellar pitching and a few clutch hits to take the advantage in the ALCS as the series now shifts to Houston for Game 6 on Friday night. 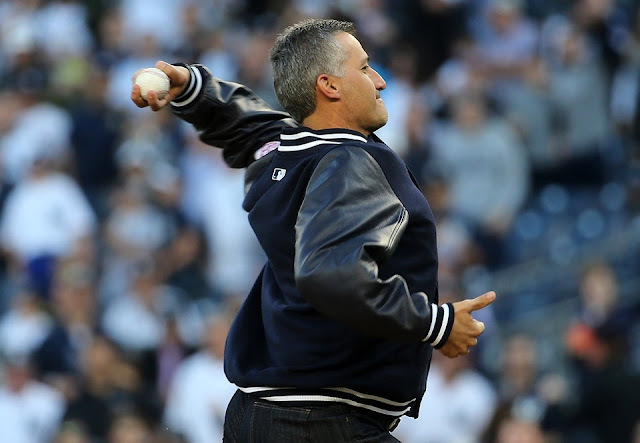 It was great to see Andy Pettitte throw out the ceremonial first pitch and it certainly brought a championship pedigree to the mound. Nothing like starting a game exactly right! As a Houstonian and a former Astro, it would be easy for Andy to root for the road team but I am so glad (and proud) that he has always been entrenched in his love for the Yankees. 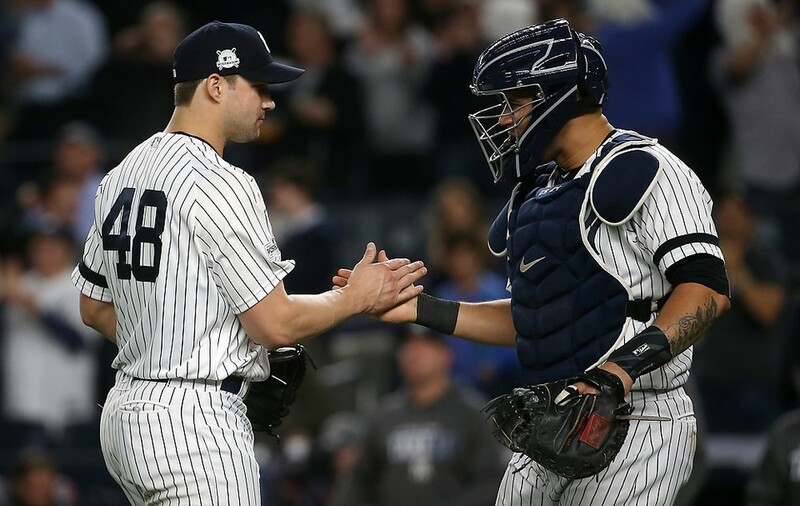 The Yankees proved that they are not afraid of Chris Sale and Corey Kluber, the AL's best, and while they may not be afraid of Dallas Keuchel, the latter has proven to be an enigma in recent years and, in particular, this season. So, there was some reservation, at least on my part, with the thought of Keuchel picking up the ball for the pivotal Game 5. First up, though, was Masahiro Tanaka to face the potent Astros line up. It was not that long ago that Jose Altuve blasted three home runs in an ALDS game against the Boston Red Sox. 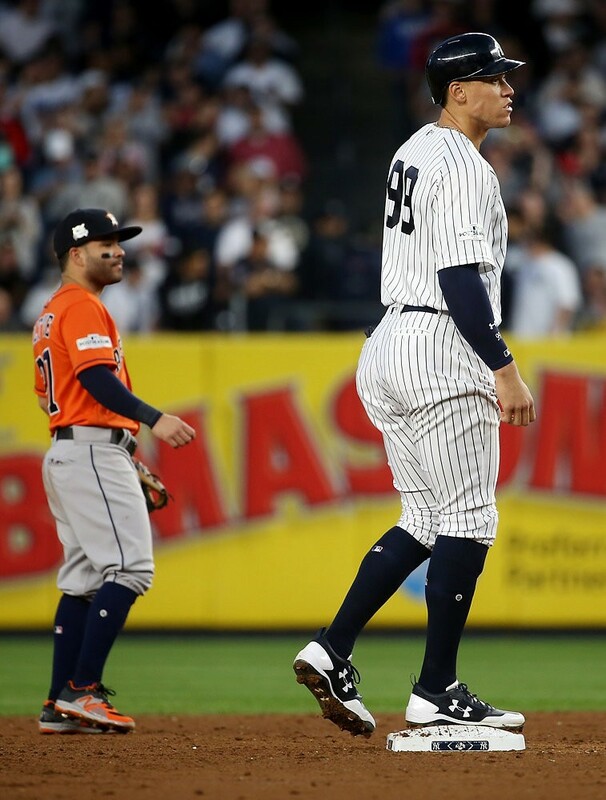 The man short on stature and long on talent will most likely beat out Aaron Judge for AL MVP. Throw in the countless other stars in the Astros lineup, and it is easy to see why the team won 101 games in the regular season. 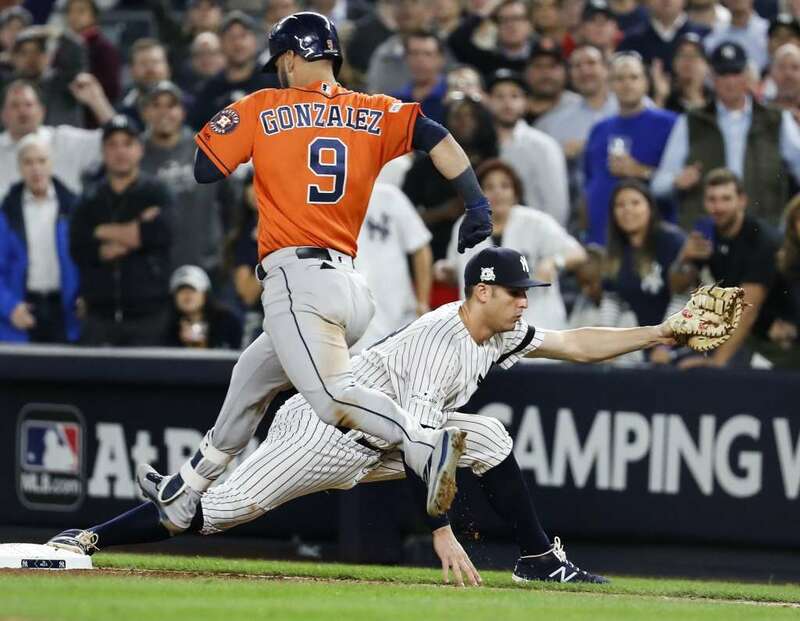 Tanaka easily retired the first two hitters, but then a fielding error by third baseman Todd Frazier allowed the dangerous Altuve to reach first base. Time and again, Altuve has worked his way through the bases, through speed and superior baseball instincts, to find home plate, but not this time. Carlos Correa hit a soft grounder to third to end the inning and send the Astros to the field for the first time. 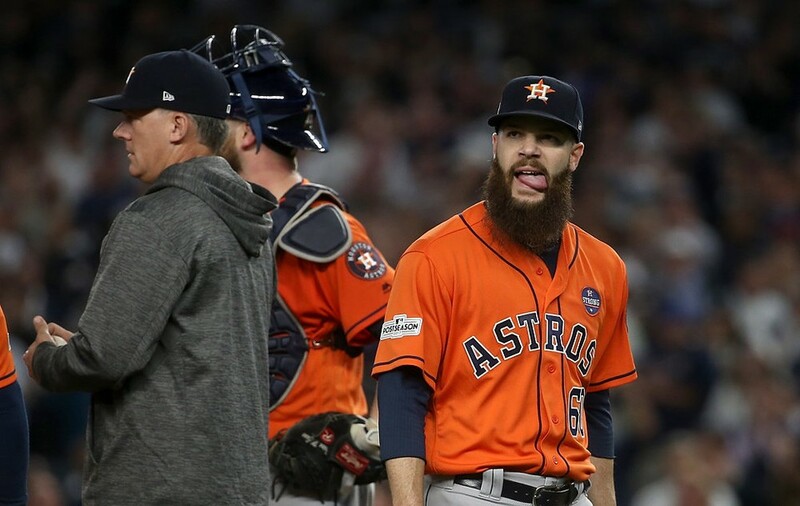 Of course, Dallas Keuchel treated the top third of the Yankees order like kindergartners trying to connect with Major League heat. 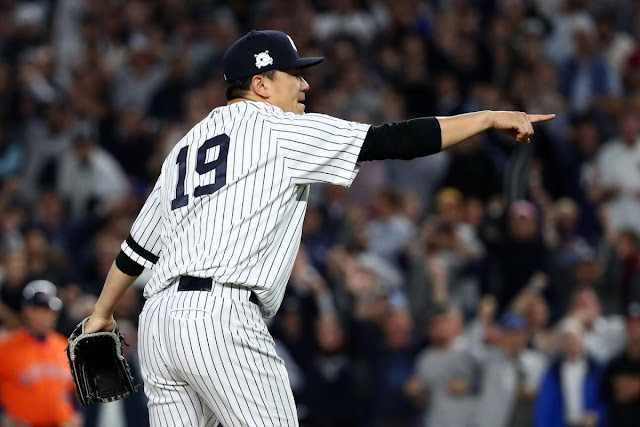 He retired the Yankees in order to complete the first inning, including strikeouts of young sluggers Aaron Judge and Gary Sanchez. It looked like it might be one of those days. Yuli Gurriel led off the top of the 2nd with a double to the wall in left to put the Astros in business. However, Tanaka wasn't having any of it. Although Gurriel would find his way to third, there would be no homecoming as Masa retired the next three hitters on ground outs. In the bottom of the 2nd, it looked like it was going to be more of the same with Keuchel. He struck out Didi Gregorius on a foul tip and got Aaron Hicks to ground out to short for the first two outs. Hits were starting to look like they would be hard to come by when Starlin Castro hit a sharp line drive to the warning track in left and off the wall for a double. Greg Bird followed with a single to right and the Yankees had their first run off Keuchel in the post-season. Todd Frazier struck out to end the inning but the Yankees were able to walk back onto the field with a 1-0 lead. After the Astros were unable to do anything with a one-out single by George Springer in the top of the 3rd, Chase Headley led off the bottom of the inning with a single to center. Brett Gardner grounded into a force out at second but all things considered, I was okay with substituting the speedier Gardner for Headley. It paid off when Aaron Judge ripped a double to the left field corner, bringing Gardner around to score. The Yankees were up, 2-0. A couple of strikeouts ended the inning, but at least the Yankees were getting their hits against the very difficult Keuchel. After the teams traded '3-up, 3-down' innings in the 4th, the Astros looked like they might put together a little rally in the top of the 5th. Tanaka struck out the first batter, Carlos Beltran, but Marwin Gonzalez followed with a single to right. A wild pitch during Brian McCann's at-bat moved Gonzalez to second. McCann subsequently took a walk to put two runners on with only one out. 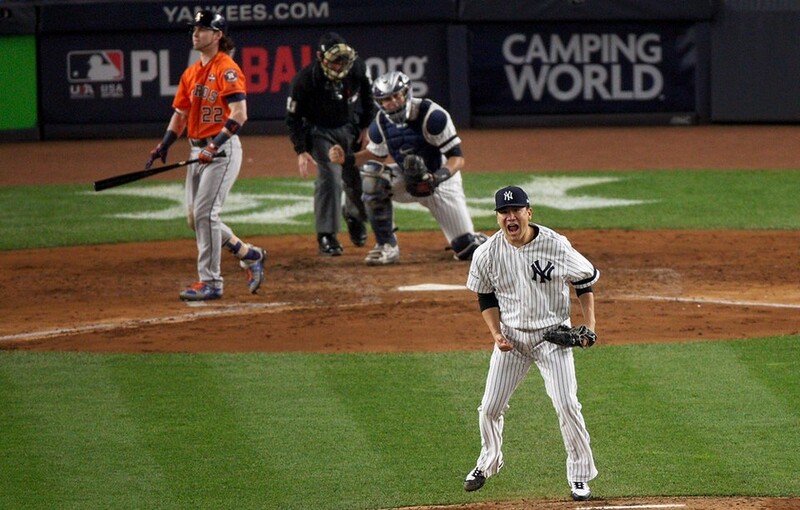 Tanaka rose to the occasion and struck out both George Springer and Josh Reddick. A huge performance by Tanaka in a tough spot. Chase Headley hit a soft grounder to third to lead off the bottom of the 5th. A throwing error by third baseman Alex Bregman (ball was low and skipped past first baseman Yuli Gurriel) allowed Headley to take second. After a ground out by Brett Gardner, Aaron Judge drew a walk. I think the FOX TV Crew described it as the 'intentional unintentional walk'. That's fine. 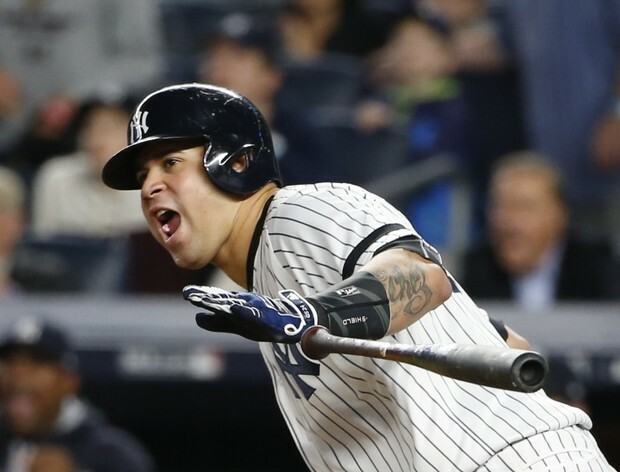 Bring Gary Sanchez to the plate. El Gary did not disappoint when he singled to left into the corner, bringing Headley home to score. Judge moved to third. Didi Gregorius lined a single up the middle that deflected off the glove of diving second baseman Jose Altuve in center field. Judge scored to make it 4-0. End of the day for Yankee killer Keuchel. The Astros made the call to the pen to bring in Will Harris. Win or lose, the Yankees were finally able to find the solution for Keuchel like they had Sale and Kluber. Harris got the Astros out of the inning when Aaron Hicks flied out to left, but it had been a very productive inning for the Pinstripers. However, last night showed that a 4-0 lead is not safe, so onward we go. Or rather I should say onward Tanaka went. Tanaka breezed through the 6th and 7th innings although the final out of the latter inning saw the third strike get away from Gary Sanchez. Fortunately, El Gary was able to retrieve the ball in foul territory and throw a zinger to Greg Bird ahead of Marwin Gonzalez to complete the final out. Regardless of the final outcome of the game, it was a masterpiece by Tanaka. Seven innings, three hits, no runs, one walk, and eight strikeouts. Okay, I think I am back in "Masa, please do not opt out" mode. While David Robertson was warming up in the Yankees bullpen, Gary Sanchez unloaded on a pitch from Astros reliever Brad Peacock in the bottom of the 7th to send it flying into the left center seats. Didi Gregorius followed El Gary with a sharply hit ball to left and he slid into second just ahead of the throw for a double. David Robertson took a seat after the Sanchez home run and Tommy Kahnle began warming up. The Yankees weren't able to do anything with Didi when Aaron Hicks struck out and Starlin Castro grounded out to third, but at least they had padded their lead by one and now led the Astros, 5-0. Kahnle, as expected, got the call for the 8th. He did his job...make it an uneventful inning and he did. A couple of fly outs and a punch out of Josh Reddick and it was time to get the Yankees back up for hopefully their final at-bats of the night. Holding a five-run lead, Tommy Kahnle returned for the top of the 9th. Jose Altuve jumped on Kahnle's first pitch to fly out to center. One out. Carlos Correa lined a hard hit ball to right for a double, causing some movement in the Yankees bullpen. Nevertheless, Yuli Gurriel hit a grounder to short which Didi Gregorius threw to first for the out. Two outs. Correa advanced to third on the play. Obviously, Correa was inconsequential at this point, but everyone wanted the shutout (well, except for maybe the Astros, their fans and the Red Sox Nation). Kahnle made it happen when he got Alex Bregman to fly out to Aaron Hicks in center. Three outs...game over. Yankees win! Best case scenario played out as the Yankees now head back to Houston needing one win in the next two games to advance to their World Series since 2009. The Astros are now the team with their backs to the wall. The road ahead remains difficult but the young Baby Bombers have heart and 'no quit' desire like none other. This was a great team victory, led...obviously...by the great Masahiro Tanaka. I am sure that Sonny Gray is asking, "What is this run support you speak of?". Greg Bird, Aaron Judge, Gary Sanchez, Didi Gregorius...too many heroes to name. Great job by Tommy Kahnle to finish off the win for Tanaka! Let's keep this winning streak alive. Great job, Bronx Bombers! Thumbs down, Guys! There was a funny Twitter exchange between the Boston Red Sox and the Yankees prior to Tuesday's game. 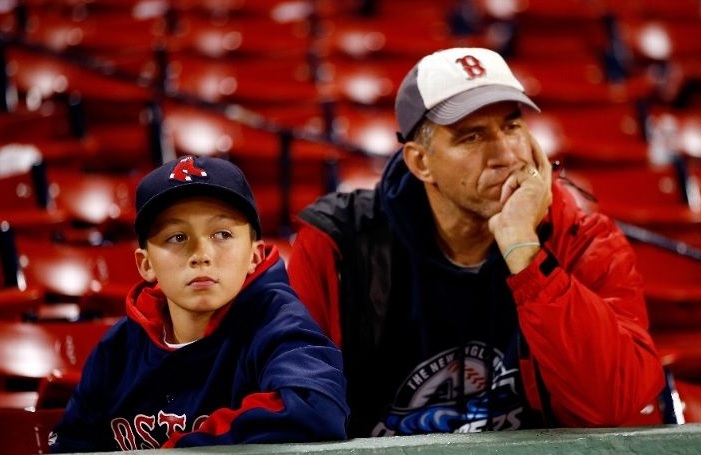 The Red Sox tweeted "Today's basically a holiday..." showing a clip of Game 4 of the ALCS on October 17, 2004 when the Red Sox tied the series on a walk-off home run by David Ortiz in 12 innings after falling behind 2 games to none. The Yankees had the perfect response, "Ah, work day for us. Game time is 5:08pm, if you're not busy". The Red Sox could only respond with a rolling eyes emoji. Have a great Thursday! It's a day off as the Yankees head back to the deep of the heart of Texas. Bring home the AL Championship, Boys! Go Yankees! So it Seems… How Many Different Heroes?